Each product group is available with standard and custom sizes, cores and hardware configurations. 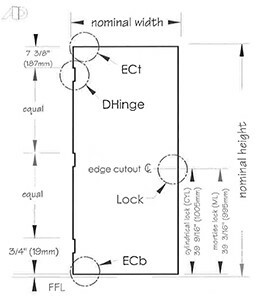 Door thicknesses up to 2 1/4″ (57mm) are available. Certain restrictions apply. Use of top caps is an optional extra and subject to all fire labelling rules. Fire rated doors shall be tested in accordance with ASTM, NFPA and UL standards and carry the mark of and be listed by an independent, recognized and accredited laboratory.